MOTORISTS caught driving at just over the speed limit are to be targeted in a new police crackdown. Police Scotland has secured legal powers to issue formal warnings to drivers who are clocked at just a few mph over the limit. Traditionally, those drivers would not face any action because police only ticket speeders who are 10 per cent plus 2mph above the formal speed limit. 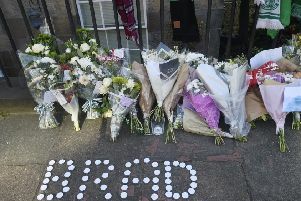 The police warnings are part of a drive by Chief Constable Steven House to make road deaths a top three priority for the force along with violence and anti-social behaviour. Traffic officers will start to issue the warnings - which will not result in a conviction, fine or penalty points - later this year under a six-month pilot scheme with a clear focus on accident blackspots. Senior officers believe early use of formal warnings for drivers who are just over the legal limit could be more effective than existing informal warnings. Although traffic officers will still have discretion to adopt the disposal they see as most fitting, a driver who already has a formal warning on his record would be more likely to be fined than one who did not. Chief Superintendent Iain Murray, head of road policing at Police Scotland, said: “We have an agreement to run a pilot of adult formal warnings, which starts in the autumn.You will get a warning that you are committing an offence. “If you then go away and do it again, I don’t think many people would have sympathy if you got a fine. “We are talking about people who might be law-abiding in every other aspect but fail to realise the risk they pose by driving on auto-pilot or failing to pay enough attention to what is going on around them. “We are seeing changes and independent studies show people are taking fewer risks on the road, but research shows that nearly half of us are still engaging in illegal risk-taking on the road each year. “The use of formal warning will enable us to challenge this behaviour, provide real-time education and monitor how behaviour changes by looking at re-offending rates. The pilot scheme may result in an official rise in the number of speeding offences recorded in Scotland. That is because a formal warning would require an offence to be added to statistics, but an informal one would not. The new national force had come under fire in its first year for the sheer scale of tickets issued for seatbelt and mobile phone offences and speeding.